I've been going to Atlantis since the mid-90s... Prior to that I was a regular at the Crystal Palace on Cable Beach. Don't believe me? Why would I lie? Once or twice a year, I'd be there dancing poolside with Stephen and Ray, playing Bahamian trivia for prizes (i.e. the prizes used to be airline sized bottles of coconut rum). Did I know any of the Bahamian trivia answers? Nope. But the little girls (i.e. daughters of the hair braiders) would tell me the answer and I'd just phonetically repeat/shout the answer. It was a great racket. Those of you familiar with the Bahamas know that Cable Beach WAS the place to be. Once Atlantis was built, I never looked back. I've been to Atlantis countless times. Many a boyfriend has made the trip with me and one even ended up buying a place over there while we were together. I swear, the property should pay me a commission. Regardless, this time around I went solo. I'm not even going to get into the reason why I went solo, in this blog ~ it's not your business and I'm still annoyed, but as a single traveler to Atlantis I must say, I'd go by myself AGAIN in a heartbeat. I love my family and friends, but I can't wait for them to align their plans with mine. Lucky for me, I'm an independent person and a creature of habit. Since I've been to Atlantis so many times I was very comfortable being by myself. But let's face it ~ large resorts are similar to Vegas (i.e. you're alone, but not really alone). Further, since I've been there so many times, I have people there that I look forward to seeing. One night I saw Boston Celtics' star, Rajon Rondo, playing craps at my table. He was a quiet guy, but was playing with $100 black chips and trying to make money on the "hard ways". The table was ice cold though. **** Incidentally, Rondo just updated his Facebook group with the following status: "Business as usual around here...working out daily, spending time with family and getting ready for the season." I took advantage of my time and actually visited Dolphin Cay this trip. I did the deep water swim and the sea lion interaction. I even mastered snorkeling (i.e. I hate choking on water with a snorkel and prefer scuba diving). I got to kiss, dance, and swim with the dolphins. I saw the medical lab and food preparation areas for the animals and then was able tokiss, pet, and hug Cassie sea lion. **** Cassie is famous. She's met Joe Jonas, Justin Bieber, and now THE WIRK. What a great adventure! Atlantis' is offering great deals through October. They're offering free companion airfare and 4th night free promotions. It's hurricane season, but I've always taken advantage of the deals and never really had a problem with weather. The hotel isn't very crowded. Hotel lounges that used to be packed are empty, but I don't mind it being less crowded. I'm not too time conscious when I'm on vacation, but if you're impatient and Type A ~ you might want to reconsider a trip to the Bahamas. The transfer shuttle isn't on time and you'll spend some time waiting, but as a native Bahamiam once told me, "Don't complain. You're in Paradise." She's absolutely correct. 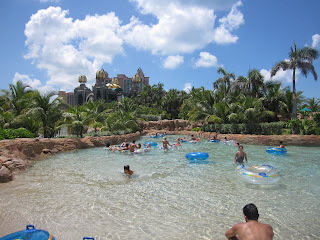 Atlantis is still one of my favorite destinations on the planet!